The forests of Pakistan reflect great physiographic, climatic and edaphic contrasts in the country. Pakistan is an oblong stretch of land between the Arabian sea and Karakoram mountains, lying diagonally between 24° N and 37° N latitudes and 61° E and 75° E longitudes, and covering an area of 87.98 million hectares. Topographically, the country has a continuous massive mountainous tract in the north, the west and south-west and a large fertile plain, the Indus plain. The northern mountain system, comprising the Karakoram, the great Himalayas, and the Hindu-Kush, has an enormous mass of snow and glaciers and 100 peaks of over 5,400 m. in elevation. K-2 (8,563 m.) is the second highest peak in the world. The mountain system occupies one-third of this part of the country. The western mountain ranges, not so high as in the north, comprise the Sufed Koh and the Sulaiman while the south-western ranges forming a high, dry and cold Balochistan plateau. Characteristically, the mountain slopes are steep, even precipitous, making fragile watershed areas and associated forest vegetation extremely important from a hydrological point of view. The valleys are narrow. The mountains are continuously undergoing the natural process of erosion. The nature of climate with high-intensity rainfall in summer and of soil in the northern regions render these mountains prone to landslides. The Indus plain consists of two features; the alluvial plain and sand-dunal deserts. The country is drained by five rivers; namely, Indus, Jhelum, Chenab, Ravi and Sutlej. Of these Indus arising in snow-covered northern mountain ranges flows towards south through the Punjab and Sindh plains into a wide delta before entering the Arabian sea. Other rivers join it on the way, together feeding one of the largest irrigation systems in the world. The great river system of Indus in Pakistan derives a part of their water supply from sources which lie in the highlands beyond the Himalayas and the western mountains, and part from countless valleys which lie hidden within the mountain folds. Much of the silt of the alluvial plain is from natural geological erosion of mountains in the north brought down by rivers. Thal desert lies between the rivers Indus and Jhelum, while Cholistan and Thar deserts occur on the south-east of the country. A great variety of parent rock types occur in Pakistan, which exerts considerable influence on the properties of the soil. The rocks found in Pakistan can be classified into three major groups, viz. the igneous rocks, the sedimentary rocks and the metamorphic rocks. In the Himalayan regions, the common rock types are metamorphic which are gneisses, schists, slates and phyllites with some quartzite and marble. In the northern part of Indus plain, between Sargodha and Shahkot small outcrops of phyllites and quartzites occur. Granite, syenite, diorite, gabbro, dolerite and peridotite are more common types of igneous rocks, which occur in Dir, Swat, Chitral, Gilgit, Zhob, Chagai, Las Bela and Nagarparker. The following forest types are found in Pakistan. These are more or less gregarious forests of low height which occur in the Arabian sea around the coast of Karachi and Pasni in Balochistan. The main species is Avicennia marina (99%). Other species like Rhizophora have disappeared over a period of time due to heavy cutting. According to the latest estimates, these forests cover an area of 207,000 ha. These are forests of low or moderate height consisting almost entirely of deciduous species. Their canopy is typically light though it may appear fairly dense and complete during the short rainy season. This type does not occur extensively in Pakistan but there are limited areas in the Rawalpindi foothills carrying this vegetation type, all much adversely affected by close proximity to habitation or cultivation. It is closely similar both in floristic composition and in structure to that developed freely in the adjoining parts of North West India. The chief tree species are Lannea (Kamlai, Kembal) Bombax ceiba (Semal), Sterculia, Flacourtia (Kakoh, Kangu), Mallotus (Kamila, Raiuni) and Acacia catechu (Kath). Common shrubs are Adhatoda (Bankar, Basuti, Bansha), Gymnosporia (Putaki) and Indigofera (Kathi, Kainthi). These are low, open and pronouncedly xerophytic forests in which thorny leguminous species predominate. This type occupies the whole of the Indus plain except the driest parts. The major tree species are Prosopis cineraria (Jhand), Capparis decidua (Karir, Karil), Zizyphus mauritiana (Ber), Tamarix aphylla (Farash) and Salvadora oleoides (Pilu, wan). Among them are a large number of shrubs of all sizes. The tree forest climax is very frequently degraded to a very open, low thorny scrub of Euphorbia (Thor), Zizyphus (Ber), etc. owing to the universally heavy incidence of grazing and other biotic factors. Edaphic variants, especially connected with degree of salinity, shallowness over rock, etc., often occur. A characteristic pioneer vegetation is developed on inland sand dunes and the semi-deserts of the areas of least rainfall. On the basis of climax vegetation, the whole Indus basin plain with the exception of parts of the districts of Sialkot, Gujrat and Jehlum, consists of tropical thorn forests. Prior to the development of irrigation, agriculture and urbanization, the area extended from the foothills of the Himalayas and low-hills in the south-west Punjab plains and Balochistan to the Arabian sea. The climax species of these forests are Salvadora oleoides, Capparis decidua, Tamarix aphylla and Prosopis cineraria, which grow on a wide range of soil textures, from flat deep alluvial soils to heavy clays, loams and sandy loams. The climate varies from semi-arid (250 to 750 mm rainfall) to arid (less than 250 mm rainfall). The summer temperature in this tract is as high as 50°C. Earlier, these forests merged with riverain forests along the river banks and with scrub forests in the low hills in the north and north-western regions of Pakistan. Together these forests provided an ideal habitat to the wildlife of the area which seasonally migrated according to their needs; during cold winter from the lower hills towards the plains in search of food and shelter, from the flood plains towards the dry areas during floods and towards the rivers during the summer drought. This is no longer the situation. Riverain forests now grow in the forms of disjunct patches over an area of 173,000 ha. Irrigated agriculture is carried over 18.668 million ha. and irrigated tree plantations over an area of 103,000 ha in this tract. These are xerophtic forests of thorny and small-leafed evergreen species. This type occurs on the foothills and lower slopes of the Himalayas, the Salt Range, Kalachitta and the Sulaiman Range. The typical species are; Olea cuspidata (Kau) and Acacia modesta (Phulai), the two species occurring mixed or pure, and the shrub Dodonaea (Sanatta) which is particularly abundant in the most degraded areas. Total area of these forests is estimated to be 1,191,000 ha. These are open inflammable pine forests sometimes with, but often without, a dry evergreen shrub layer and little or no underwood. This type consists of Chir pine (Pinus roxburghii) forests found between 900 m and 1700 m elevation in the Western Himalayas within the range of the south-west summer monsoon. It is the only pine of these forests though there is a small overlap with Pinus wallichiana (Kail, Biar) at the upper limit. The evergreen forests of conifers, locally with some admixture of oak and deciduous broad-leaved trees fall in this category. Their undergrowth is rarely dense, and consists of both evergreen and deciduous species. These forests occur between 1500 m and 3000 m elevation in the Western Himalayas except where the rainfall falls below about 1000 mm in the inner ranges, especially in the extreme north-west. These forests are divided into a lower and an upper zone, in each of which definite species of conifers and/or oaks dominate. In the lower zone, Cedrus deodara (Deodar, diar), Pinus wallichiana, Picea smithiana and Abies pindrow (Partal) are the main conifer species in order of increasing altitude, with Quercus incana (rin, rinj) at lower altitudes and Q. dilatata above 2130 m. In the upper zone Abies pindrow and Q. semecarpifolia are the dominant tree species. There may be pockets of deciduous broad-leaved trees, mainly edaphically conditioned, in both the zones. Alder (Alnus species) colonizes new gravels and sometimes kail does the same. Degradation forms take the shape of scrub growth and in the higher reaches, parklands and pastures are subjected to heavy grazing. These are open evergreen forest with open scrub undergrowth. Both coniferous and broad-leaved species are present. This type occurs on the inner ranges throughout their length and are mainly represented in the north-west. Dry zone deodar, Pinus gerardiana (Chalghoza) and/or Quercus ilex are the main species. Higher up, blue pine communities occur and in the driest inner tracts, forests of blue pine, Juniperus macropoda (Abhal, Shupa, Shur) and some Picea smithiana (e.g. in Gilgit) are found locally. Evergreen conifers and mainly evergreen broad-leaved trees occur in relatively low open canopy, usually with a deciduous shrubby undergrowth of Viburnum (Guch), Salix (Willow, Bed), etc. The type occurs throughout the Himalayas from about 3,350 m to the timber limit. Abies spectabilis and Betula utilis (Birch, Bhuj) are the typical tree species. High level blue pine may occur on landslips and as a secondary sere on burnt areas or abandoned clearings. Rhododendrons (Bras, Chahan) occur in the understorey but do not form extensive communities as they do in the central and eastern Himalaya. Dwarf junipers are often abundant. Under this type are included shrub formations 1 m to 2 m high extending 150 m or more above the sub-alpine forests. The characteristic genera are Salix, Lonicera (Phut), Berberis (Sumbul, Sumblue), Cotoneaster with Juniperus and occasionally Rhododendron or Ephedra (Asmania). Forest area of Pakistan reported in different official documents has varied over the years with administrative and political changes in country as well as with changes in methods of reporting data. Different government departments have been publishing different forest statistics since 1947 when Pakistan was created as an independent country. Most recently, data of land use including forest area have been reported by Forestry Sector Master Plan (FSMP) Project in 1993, with the help of Landsat Satellite Thematic Mapper Images at a scale of 1:250,000 covering the whole of Pakistan. This is presented in Table 1. The total area of forests in Pakistan according to the following table is 4.224 million ha which is 4.8% of the total land area. However, it may be mentioned here that the farmland trees and linear planting along roadsides, canalsides and railway sides covering an estimated area of 466,000 ha and 16,000 ha respectively do not constitute forests within the context of legal, ecological or silvicultural/management definition of forests. The situation is also similar, but to a lesser extent, in the case of miscellaneous plantations over an area of 155,000 ha. If the area of these three categories of plantations is excluded from total forest area of 4.224 million ha, then the latter is reduced to 3.587 million ha which is approximately 4.1 % of the total area. On the basis of forest area given in Table 1, the percentage forest cover for each province/territory is as under. All the forested area in the country does not have dense tree cover. 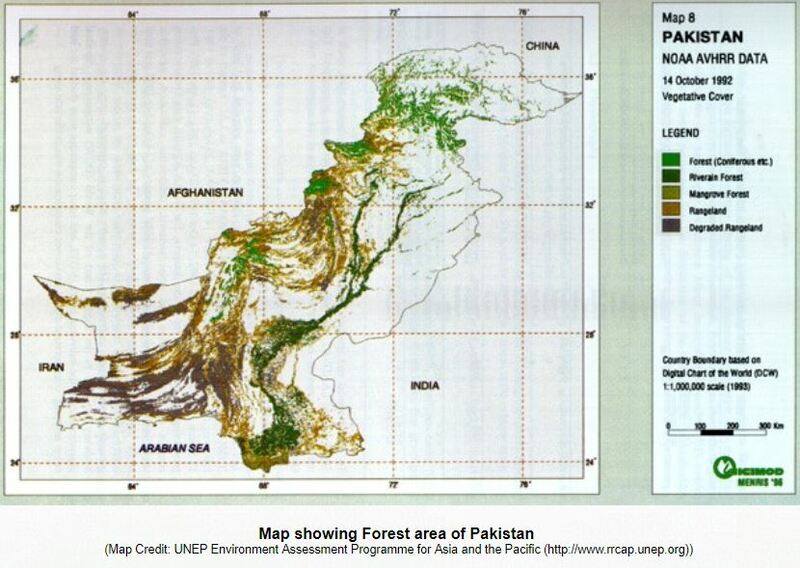 The FSMP Project gives the following estimates of density of forest/tree area from interpretation of satellite imagery for coniferous forests (coniferous/scrub for Northern Areas), scrub forests, riverain forests, for Azad Jammu and Kashmir (AJK), Balochistan and NWFP (and not Punjab and Sindh), mangrove forests and irrigated plantations. Government records for riverain net forest areas in the Punjab and Sindh were also used by the FSMP. Timber Consumption: According to Forestry Sector Master Plan 1992, per capita timber consumption is 0.026 m3 and therefore, the estimated total timber consumption for population of 124.66 million in 1992-93 is 3.253 million m3. The contribution of state controlled forest to this consumption according to office records of all Forest Departments in 0.470 million m3 (14.4%); imports of wood and wood products is 1.280 million m3 (39.3%) costing to Rs.4704.3 million, most of which is in the form of pulp and paper (92%) and farmlands provide the balance 1.503 million m3 (46.2%) of timber. Fuelwood Consumption: The FSMP per capita also gives per capita fuelwood consumption of 0.208 m3 and total fuelwood consumption in 1992-93 was thus estimated at 25.95 million m3 for both industrial and domestic purposes. Of this total 23.355 million m3 (90%) is contributed by farmlands and waste lands and the rest 2.595 million m3 (10%) is supplied by state controlled forests in the form of recorded and un-recorded removals. On the other hand, the Household Energy Strategy Study of 1993 finds that the annual fuelwood production is 32.33 million m³ and annual consumption is 46.148 million m³. The fuelwood gap for Pakistan is estimated at 13.82 million m3. This gap is very close to that estimated by Forestry Sector Master Plan of 15.1 million m3. Other studies have also given somewhat similar estimates. Current consumption of wood as well as its estimated demand are given in Table 3 and 4 respectively. Forestry Sector Master Plan, 1992. Includes Industrial Fuelwood of 0.204 million m3. Source: Forestry Sector Master Plan, 1992. Reliable and complete inventory of forest growing stock are not available nationally. Forest Department Working Plans cover approximately 50 % of coniferous forest area and contain estimates of volume, but many of these are based on outdated inventories. Coniferous forests of NWFP, Punjab and AJK have more complete inventories than other forests. The FSMP compiled data for 1.3 million ha area of 29 working plans in NWFP, 3 in Punjab and 4 in AJK, and 3 working schemes in Northern Areas. The growing stock of coniferous forests covered by these plans/schemes was 185 million m³ or an average of 145 m³ per ha. Applying the average standing volume per ha. for each province, gives the following total coniferous growing stock. The species composition of the growing stock of coniferous forests was also determined from 29 working plans of NWFP which is given below. The percentages are not for individual trees of these species, but for forest types dominated by one or two species. Estimates of growing stock of scrub, riverain and mangrove forests, and of irrigated, linear and other plantations are not known. Nationally, Pakistan has a growing stock of trees on farms totaling 70.29 million m3. If added to growing stock in forests the total becomes 301.89 million m3; farm trees account for 23% of this total. In Punjab, however, farm trees have 86% of the provincial growing stock – the highest in the country. The growing stock of trees on farms when averaged over an area of total agricultural land from Table 1 (20.58 million ha) gives a total stock of about 3.42 m³/ha as a national average. Very valuable information, especially to those making and implementing forest and environment projects. Your valuable input regarding wildlife and environment is needed, sir.